Light can be so many things The twinkle of a faraway star, a firefly captured in a jar, a mother's love, a turtle dove . 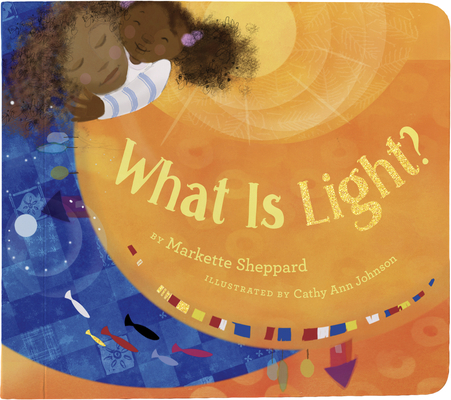 . .
Lyrical text and crisp, cheerful illustrations illuminate What Is Light?, each page revealing the sparkle found in a child's simple but extraordinary world. Young readers will enjoy discovering the special glow in everything from nature to the smiles of loved ones. The light revealed on the final page makes a fitting finale for this sweet, bright tale. Markette Sheppard is a broadcast journalist and an award-winning talk show host in Washington, DC. Her work has been featured on the Today Show and Live with Kelly, as well as in Essence and over the airwaves of NPR. Born and raised in Southern California, she earned her bachelor's degree from California State University, Dominguez Hills, and a master's degree in interactive journalism from American University. She lives in Washington with her husband and young son. Cathy Ann Johnson is an award-winning children's book illustrator and the owner of Soul Ah-Mazing Productions, a company dedicated to children's product creations. She lives in Decatur, Georgia.